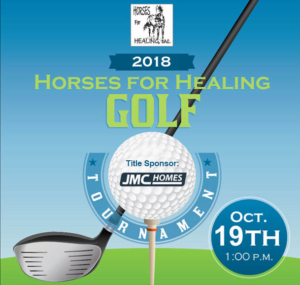 Please join us for the 2018 Horses for Healing Golf Tournament at the beautiful Ridge Golf Course & Events Center on Friday, October 19th! The Ridge Golf Course is 170 acres of oak-studded knolls, rolling grassy hills and beautiful rock outcroppings that make for gorgeous views. The tournament includes 18 holes of golf, cart, range balls and taco bar awards dinner…and you’re helping Horses for Healing Therapeutic Riding Center, serving children and adults with special needs in Placer County since 1997. Please click on the button below to sign up now as a foursome ($400) or as a single player ($125). For more information or to learn about Sponsorship opportunities, please call 530-887-9573.